Not since the end of World War II has the world seen anything as close to a Fourth Reich recreation of a Third Reich regime as it has seen in Ukraine. 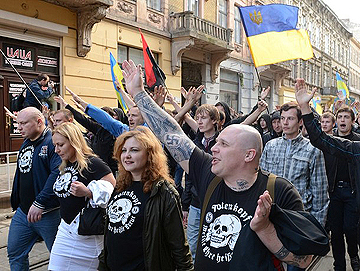 Just as many of the German Nazi Party’s Brown Shirts were transformed by Adolf Hitler into loyal members of the SS, neo-Nazi gangs in Ukraine have been sworn into the new Ukrainian National Guard. These Ukrainian National Guardsmen have been responsible for heinous actions against Russian-speaking Ukrainians in cities and villages across eastern and southern Ukraine. 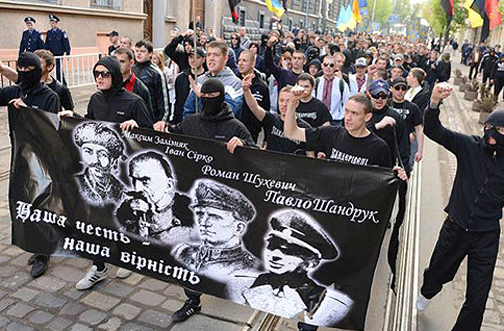 After Nazi gangs and Nazi-led-and-manned Ukrainian National Guard forces burnt alive 46 pro-Russian protesters and other civilians in the trade union building in Odessa, Assistant Secretary of State for European and Eurasian Affairs Victoria Nuland perjured herself in testimony before the House Subcommittee on Europe and Eurasia in stating there were no armed Nazis supporting the regime that ousted democratically-elected President Viktor Yanukovych. Many of the civilians found burnt to death in the House of Trade Unions on May 2 were discovered to have been shot and strangled by armed “sotniks,” pro-Kiev “Right Sector” Nazi gang members, before they were consumed by flames. The Odessa police and fire department were ordered by Ukrainian authorities to stand down and not rescue the people trapped in the burning building. After the Odessa massacre, the trade unions building was spray-painted with swastikas and Galician SS symbols. The Galician SS, the political predecessors of many current Ukrainian nationalist groups, fought alongside German army and SS units who massacred tens of thousands of Russians, Ukrainians, Poles, and Jews in World War II. In addition, it has been reported that FBI agents from the same unit that was responsible for the 1993 fiery conflagration perpetrated on the Branch Davidian religious compound in Waco, Texas, that burnt alive 74 men, women, and children, were involved in directing Ukrainian right-wing forces in the siege of the trade unions building in Odessa that killed 46 with dozens, perhaps as many as 48, still missing. CIA agents and former Blackwater, now Academi, mercenaries working for Greystone, Ltd. of Barbados, were also reportedly involved with directing Right Sector and other Ukrainian National Guard forces in the siege of the building in Odessa. German intelligence has pinpointed Greystone mercenaries in Odessa and in the eastern Ukrainian town of Slavyansk, scenes of Ukrainian operations against pro-Russian activists. There have been reports that 20 Greystone mercenaries have been captured by pro-Russian forces in the Donbass region and that CIA director John Brennan flew last month to Kiev, in part, to seek their release. Brennan also promised additional CIA resources for the Kiev regime. Yanukovych, speaking from exile in Russia, stated that Ukraine today resembles Nazi Germany. He spoke of attempts to mete out collective punishment to the people of eastern Ukraine through blockades. “Whole cities in Ukraine are experiencing a blockade only because the people are defending their viewpoint,” Yanukovych said. The new Ukrainian National Guard has also borrowed from the Nazis and placed a version of the German Iron Cross, in the deep crimson color found on the German Nazi flag, on its own flag.During the recent referendum for the secession of the People’s Republic of Donetsk and Luhansk People’s Republic in the Donbass region of eastern Ukraine from the rest of the country, plebiscites that passed overwhelmingly, armed neo-Nazi Right Sector gangs and other gangsters loyal to the Ukrainian-Israeli oligarch governor of Dnipropetrovsk, Ihor Kolomoyskyi, fired indiscriminately on people waiting in line to vote. Two voters were shot to death in Krasnoarmeysk. 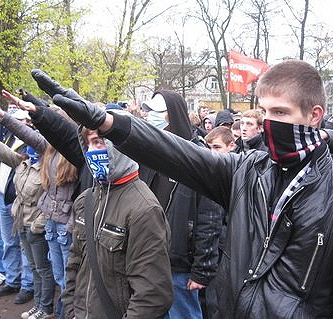 Many of the neo-Nazi and Zionist gang members had recently been sworn into the Ukrainian National Guard. As a U.S. 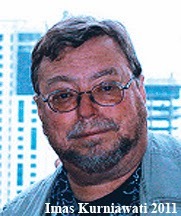 Naval Officer, he managed one of the first computer security programs for the U.S. Navy.Madsen has been a frequent political and national security commentator on Fox News and has also appeared on ABC, NBC, CBS, PBS, CNN, BBC and MS-NBC. He has been invited to testify as a witness before the US House of Representatives, the UN Criminal Tribunal for Rwanda, and an terrorism investigation panel of the French government. A member of the Society of Professional Journalists (SPJ) and the National Press Club.